A reality check from around the country shows that health departments, hospitals, foundations and collaboratives all face a similar sign of the times: Do more with fewer resources. For many, this challenge has spurred creative thinking and innovative population health strategies. Among the emerging solutions is “results-based accountability” that leverages data to track health improvement programs, while enabling the public and stakeholders to readily measure the impact of each. Locally, KC Health Matters has taken this metric-driven approach and fostered a culture where easily accessible and up-to-date data drives the decision process for all proposed initiatives. The Health Forward Foundation partnered with Healthy Communities Institute (HCI), a group of public health experts who work with organizations in over 35 states, covering more than 90 million lives. HCI empowers communities with their cloud-based population health risk profiling technology and a national database of thousands of evidence-based programs that others have used successfully to address specific areas of need. The use of data-driven decision making enables multiple stakeholders to effectively and efficiently work together, eliminating what might have been duplicated efforts (and spending) against the same initiative. DC Health Matters, an HCI client based in Washington D.C., is a prime example of the huge effect this can have on a community, even when the stakeholders are traditionally viewed as competitors. The HCI powered, web-based portal provides all the Washington D.C. partners with a way to identify strategies specific to their hospital or organization, while also enabling them to jointly answer, “Are we moving the needle?” as they track progress over time. 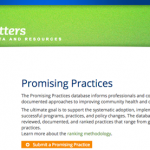 In the video interview on the home page, you’ll also hear how the DC Health Matters portal provides community-based organizations with tools for coming together around the data to coordinate efforts with like-minded groups, breaking down silos to maximize funding opportunities and achieve measurable impact. You can see their process and progress (as can everyone in their community!) by clicking here. Kansas City, Washington, D.C., and Nashville are all great examples of how local leaders are “moving the needle” to address specific community needs through strategies that support results-based accountability.